Below is a list of supplies each teacher is using in their workshop. Please don’t let this list intimidate or overwhelm you. 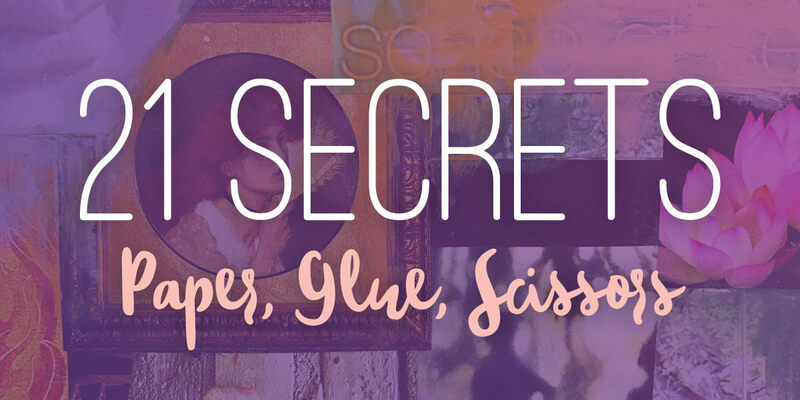 As always in 21 SECRETS, you are encouraged to create with what you have on hand. For my art background (optional) I used: Heavyweight paper for mixed-media, Golden Heavy Gel Medium, assorted cotton (quilting) fabrics and craft paints, brushes, a little water and paper towels. Print your digital artwork on high-quality paper (like Epson Photo Paper) or, go to a print store like Fedex or Copymat. *In the alternative you can use any good fine line ink pen that will write over bumpy lumpy bits and bobs. Mixed media paints, inks, markers, crayons, rubber stamps, stencils, etc. Embroidery threads – gray, rust, colors you like. Vintage book pages, vintage wrapping papers, art paper you collect, maps. Use what you have. Do not purchase all of these. These are just ideas for you. Seed beads, random beads left over from other projects. Nothing fancy. Copies of drawing to use in your collage (I will supply a sheet of my drawings that can be used if you don’t have your own.